Not a brain cell was resting, not even the mouse's. Have just given up the hope of a long winter's nap. For no Christmas projects seem ever to come from the stash. But the mailman with boxes enough for a year! I knew in a moment it must be Josh's tricks. On ebay can all this abundance be blamed! "Please let me have this all done before Christmas Night!!!!!!" Yes, we have started planning our Christmas presents! 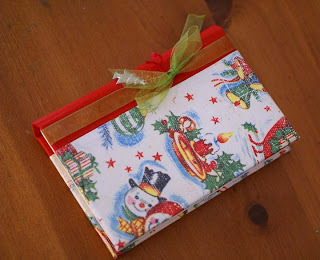 I have a little Christmas notebook where I record all the presents I give to everyone each year. The notebook is about 10 years old and it's invaluable to me! It's fun to see what I've given people over the years. 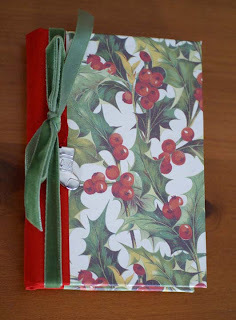 In momentous news, I have FINALLY put some things up in the etsy shop, including these two Christmas notebooks which I totally love. Check it out and let me know what you think! I have a hard time assigning prices to things. That's the least fun part of it all! You have some really great things in your shop! Those journals are lovely! Every year I promise myself I'm starting the Christmas gifts early. I need to get started. Fret not Keri I am going to buy your notebooks and give them to you for Christmas that way you will have a perpetual stash!!! They are lovely-great paper too.